It's been a busy few days with a cake order straight off the plane from LA. 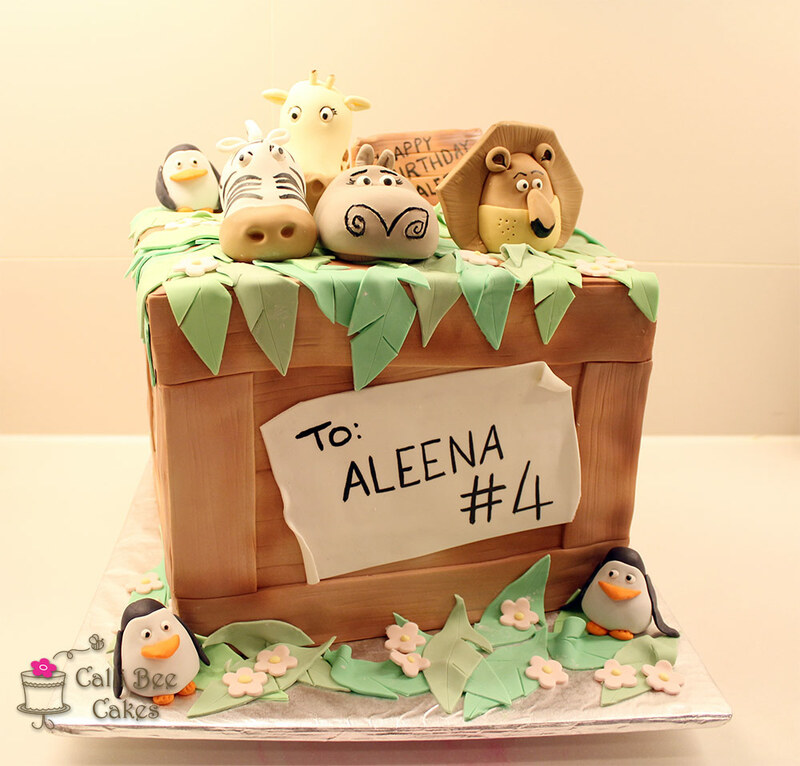 This was for a good friend of mine, whose little girl wanted a Madagascar themed cake. The party was for over 70 people (adults and kids combined), so you can imagine how big the cake had to be. The cake itself was chocolate vegan cake with non-dairy chocolate buttercream, covered in fondant decorations. The animals were all made from gumpaste. The cake measured over 14 inches across and 12 inches tall! It was one HEAVY cake. 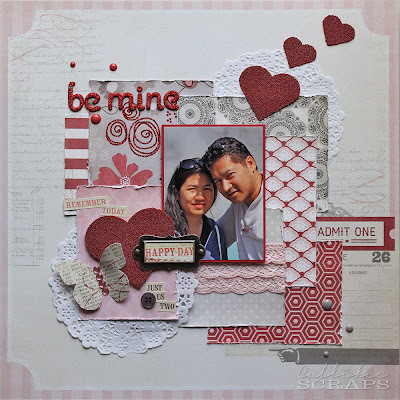 Scrapbooking-wise, I've been busy finishing several layouts; three HKMC February kit club samples (I'll be posting them at the end of this month), and two Valentine's layouts. 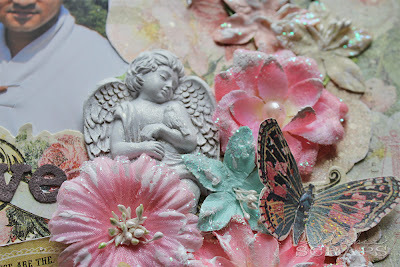 It's so great to be scrapbooking after several weeks without it (less the workshops I did in LA, that is). The first one makes use of My Mind's Eye Lost and Found 3 Ruby Collection. Such a pretty collection with pinks and reds. Perfect for the lover's holiday. The layout is based on the January sketch challenge from My Creative Sketches. 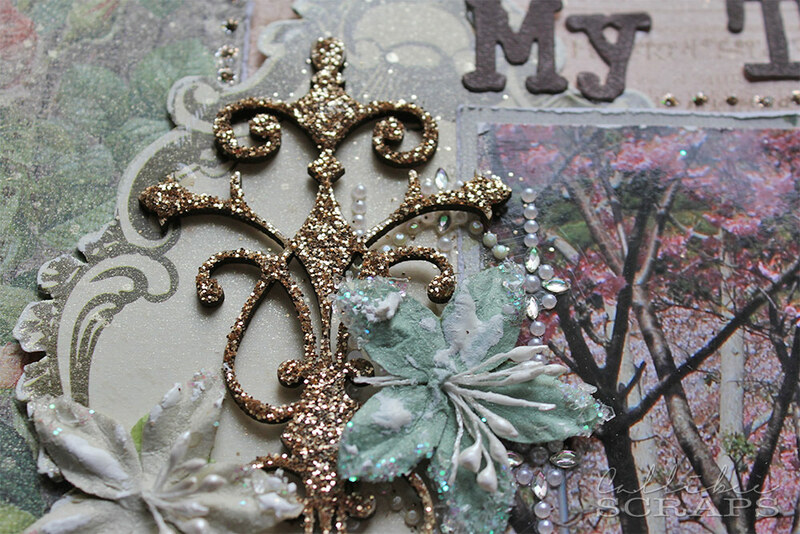 Beautiful papers; some embossed, some glittered. 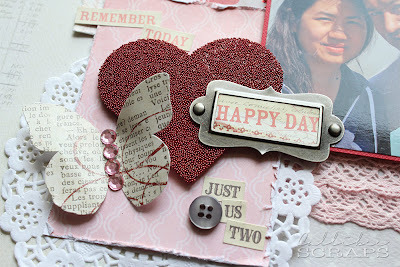 Love the reds, greys and pinks here. The hearts are my favourite thing on the layout. I cut different papers into small rectangles and distressed the edges before layering them like the sketch. For the red hearts, I laid double sided tape on one side (with the backing paper still over the top), then ran it through my Big Shot with a Sizzix Framelits heart die in several sizes. I then peeled off the paper and sprinkled on red microbeads and really pushed them into the sticky tape. Some did come off, but it mostly held fast. The butterfly is a sticker that I removed the sticky from and added pink bling. 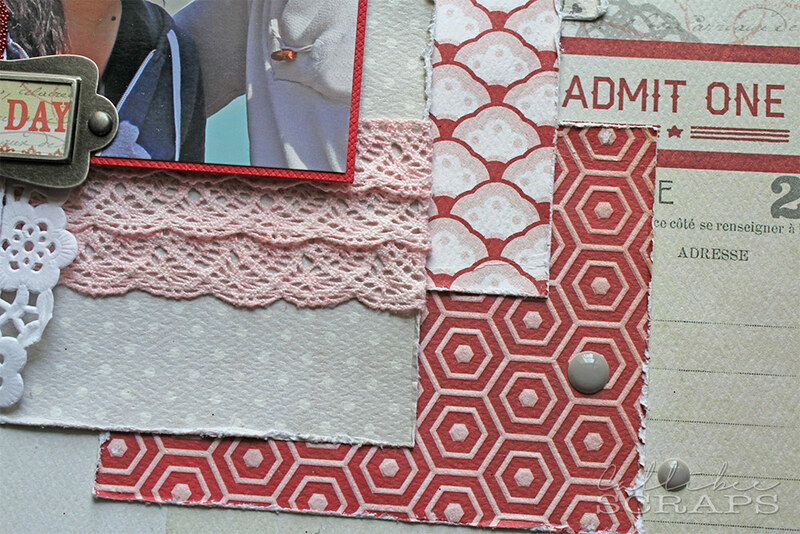 I wrapped three layers of trim around the grey polkadot patterned paper for more texture. The hexagon embossed paper is my favourite. Also love the enamel dots - they give such dimension. 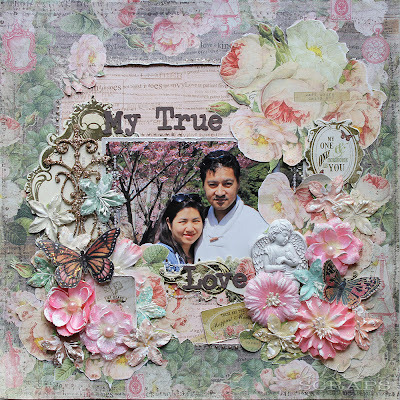 For the second layout, I wanted to do an ultra flowery, romantic page and used most of the November limited edition kit from My Creative Scrapbooks. I didn't put any hearts on this layout, but the amount of flowers and the psalm that is printed on the papers (from 1 Corinthians 13, which was read at our wedding), very much indicates "love". The photo was taken in Japan last spring, when the flowers and trees were in full bloom. One of the more flowery paper collections that I've used, the roses are ideal for fussy cutting. I also cut a frame out of the top paper and backed it with a pink wordings paper. Look at the little angel sitting on the edge of the flowers. I smeared some gesso on the flowers to mute the pink down a little and add to the faded look. I then spread a thin layer of glitter glue over the butterflies. After the whole layout was done, I covered the photo with some scrap paper and sprayed the whole layout with iridescent Glimmer Mist. The chipboard flourish was covered with diamond glaze before sprinkling on a light gold glitter. I also cut up a Prima crystal border to stick around the photograph and then dotted some glitter glue around the edges of the frame and photo. After these layouts, I think it's time to do something mix media-ish, so I'm going to be breaking out the paints, gels and gessos. Watch this space for more. Beautiful work! Love the pink and red! Thanks for joining us at MCS! 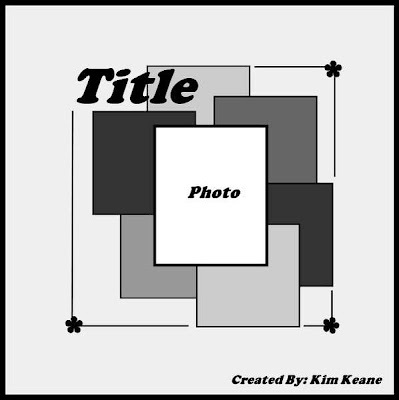 Your layouts are beautiful! And the cake looks yummy!! Thanks for playing along with MCS! Wow!!! That is one amazing cake!!! It is to cute to eat!!! Thanks for joining in the fun at My Creative Sketches! Your layout is just gorgeous. That is such a sweet picture too. Thanks for playing with us in My crwative sketches!!!! I love your layout; the colors, the take on the sketch, and the photo. Thanks for sharing your take on the sketch.